At Seoul Foreign School we provide the state of the art Cloud Printing Infrastructure. With it anyone can print from literally anywhere on the school network and have their print job sent to a multitude of printers ready for them to continue the print job there. However to get started requires some driver installation. For Windows PC the most important thing that you must know about your computer is the bit version of your operating system. Go to My Computer> Right Click>Properties to find your bit version. Installing the cloud printers on Windows is dead simple. Once the driver file is downloaded onto your computer, double click. It will appear as though NOTHING will happen, but actually the install process is just double-clicking the file and, you're done. To be sure you should just double click it, wait, and do nothing for 2 minutes, then delete the file. In some cases, a warning message will pop up, asking whether you trust the software, and it will ask for your permission to install it. Double-click on printermac.dmg (the downloaded file) and a drive will be mounted on your desk top in the same way a USB does. If it does not show up on your desktop go to Finder and it should be present on the bottom left hand corner. Once you are in the mounted DMG, double-click the Fuji Xerox Package to run the Installer Wizard. n Mountain Lion and newer version of Mac OS there is a feature called Gate Keeper which aims to protect your computer from dangerous software downloaded from the Internet. By default the Mac OS will only allow apps that are downloaded from the Mac App Store or an app that is made by identified developers. However, to install the cloud printer driver you need to disable it first. Click here to find out how to disable Gatekeeper. The First step is to go to System Preferences, and click on the Print & Scan section, or the section that has the Printer icon on it. In this Window, the easiest way to progress is to search for C5570 and select FX ApeosPort-IV C5570 v3017.104 PS. On some occasions the option will not show up, in order to fix this you must run a system update first. To do so go to the Apple Icon (Top Left Hand Corner) and click Software Update.... From there install any system updates and restart your computer. then you can try to find teh Printer software again.and may have to start again from Step 4. Open up a Word Document and go to the Print Options Dialogue by pressing CMD+P or File>Print. 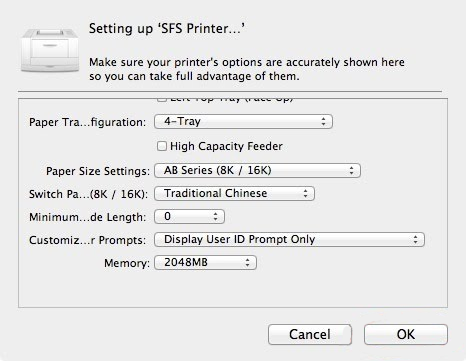 Once there make sure the printer selected is the SFS Printer and find the options menu. In the Options Menu selection drop down to the Job Accounting section and click the User Details Setup... button. After you have pressed OK after the User Details Setup and pressed Print, a dialogue will pop up and ask you for user IDs and Passwords. Put in your school ID number and your corresponding password. Then press OK. Now your print job should be successfully sent to the Printer, congratulations!